Choose Chandigarh cabs for Jalandhar to Delhi Airport taxi services as it is the best option. With excellent services, you can now book taxi service from Jalandhar to Delhi Airport in the easiest way with few simple clicks or call on 7814646464. We also provide one way taxi from Delhi Airport to Jalandhar taxi at affordable rates @ Chandigarh Cabs. We have all range of cars available as per your need. In hatchback we have Tata Indica, in Sedan, we have Tata Indigo, Maruti Swift Dzire, Toyota Etios, Tata Zest and in SUV we have Toyota Innova, Tavera, Xylo, Maruti Ertiga. If you are going to or travel from Airport, you should have large number of luggage, to solve this problem we will arrange top carriers as per your request. We provide round trip as well as one way taxi from Jalandhar to New Delhi International and Domestic Airport. In one way booking, you will not need to way for round trip. We will only charge to our customers for one way journey. Call us on 7814646464. Tell us your travelling date & time. Your booking is confirmed with us. After booking, you will be received a booking confirmation SMS with driver & car details. We also provide one way taxi service from New Delhi Airport to Jalandhar Taxi Service. 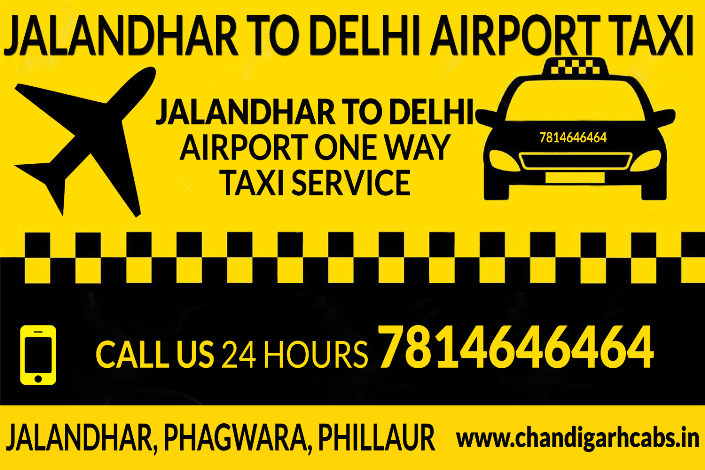 Charges from Delhi Airport to Jalandhar Taxi Service is cheaper then Jalandhar to Delhi Taxi service. Booking procedure is same as mentioned above. Pre-booking and instant booking are also available with Chandigarh Cabs. We also provide taxi from Phagwara & Phillaur to New Delhi IGI Airport 24×7, 365 days. The distance between Jalandhar to Delhi Airport is approximate 395 KM’s and to cover this distance you have to travel 6 Hours in normal traffic. You can enjoy good food while travelling to Delhi Airport at many famous Dhaba’s on national Highway. Excellent taxi service from Jalandhar to New Delhi Airport. Thanks for it.